Do you have some great ideas but can’t get the funding required from the traditional means – well, crowdfunding is the way forward. We’re quite sure you’re familiar with the concept, but the re-cap, crowdfunding is a way of raising capital for a business over the internet by looking for investment from people who believe in your idea. Crowdfunding figures speak for themselves and according to Massolution it grew by 81% in 2012 year on year and also 61% in 2011 year on year. Predictions are for over 100% growth in 2013, with crowdfunding figures globally expected to hit above $5bn. So, obviously there’s plenty of potential for those with a good idea. However, how do you pitch a successful crowdsourcing attempt? Clarity is central to success and you need to clarify what your idea is about in a concise but detailed summary. If you’re not blessed with the gifts of a wordsmith, then consult someone who has the requisite skills to write the pitch for you. A picture speaks a thousand words and you should create compelling video or images that will intrigue and interest. Once again, if you don’t have the skillset required then you should use someone who has. Videos tend to do better than stills, but a good version one of either still or video is very important. 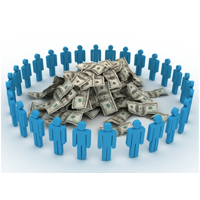 If you have a lot of social media friends then you’re off to a good start on a lot of the crowdfunding sites out there. Many of these sites have an onus on social media. Google+ is an often overlooked but vital social media area for crowdfunding, thanks to its tech savvy user base, utilising it can herald a lot of interest. There are plenty of great ideas out there and there are also plenty of poor ones too. So, before you send your campaign to go, ask your closest friends and family what they think. If they don’t believe it will work, then it’s less likely strangers will. Take a closer look at the communication at hand and get some impartial views before launching fully. This can be all so important. By seeing crowdfunding as a form of payment method, rather than a form of investment capital, you often stand a significantly better chance of success. Seeing funders as customers and the end product as the thing they are purchasing can be an eye opener and leave you open to a larger group of potential funders/customers. This amazingly successful crowdfunding attempt worked in a similar vein and saw $4.1m raised to help Torment create their science fiction role playing game.